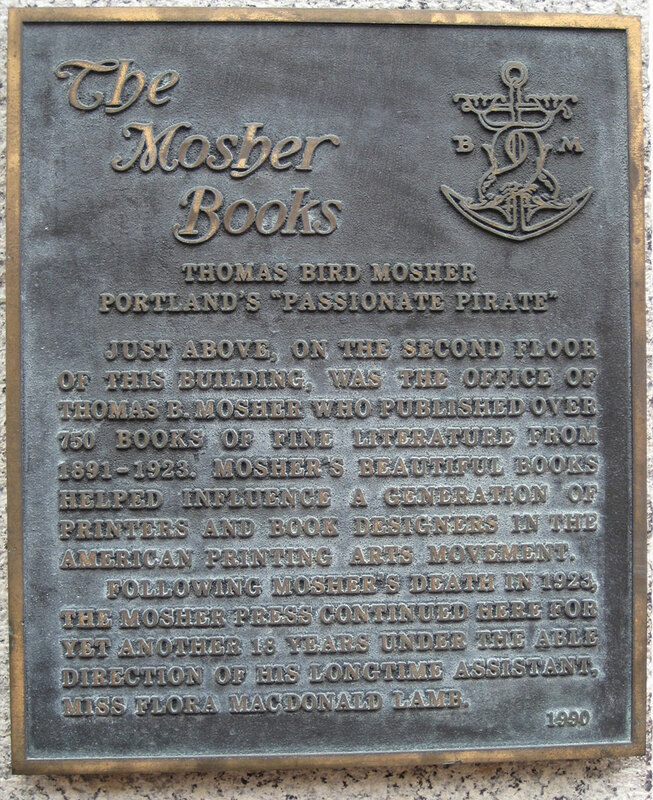 The above words are printed on a brass plaque erected at Mosher’s business location in Portland, Maine. Three people paid for this plaque and presented it to the City of Portland in the downtown business district. 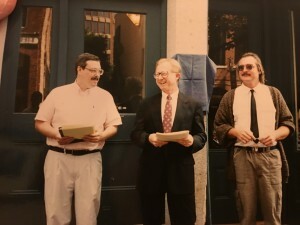 Those three patrons were David Turner, Jean-François Vilain, and myself. 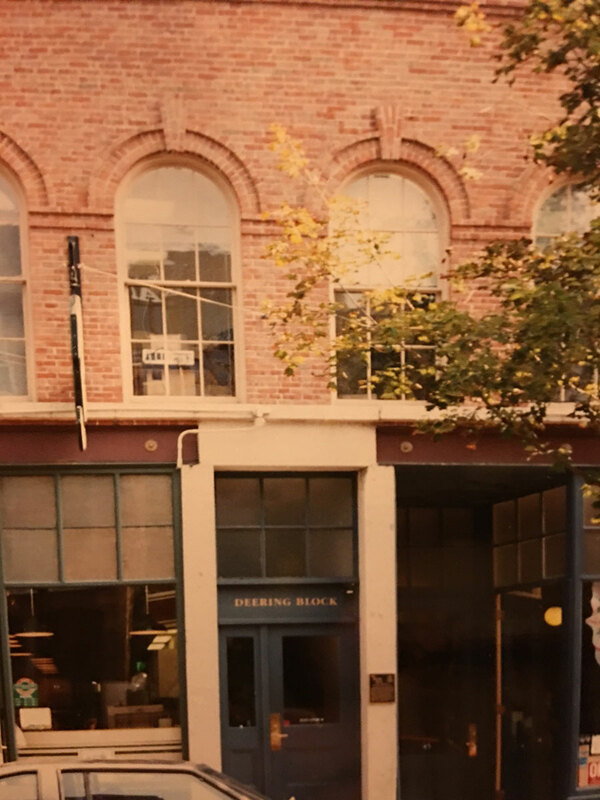 The following remarks were made by me at the unveiling ceremony on August 16, 1990 at 45 Exchange Street just below the windows of the publisher’s former business premises. There were twenty-two people in attendance including Donald Dede who collected Mosher books, Dorothy Healy of the Maine Women Writers Collection of Westbrook College, Norma Carlson of Carlson & Turner Books, Susann Bishop, the staff of the Dirigo Management Company, and a few other Portlanders. 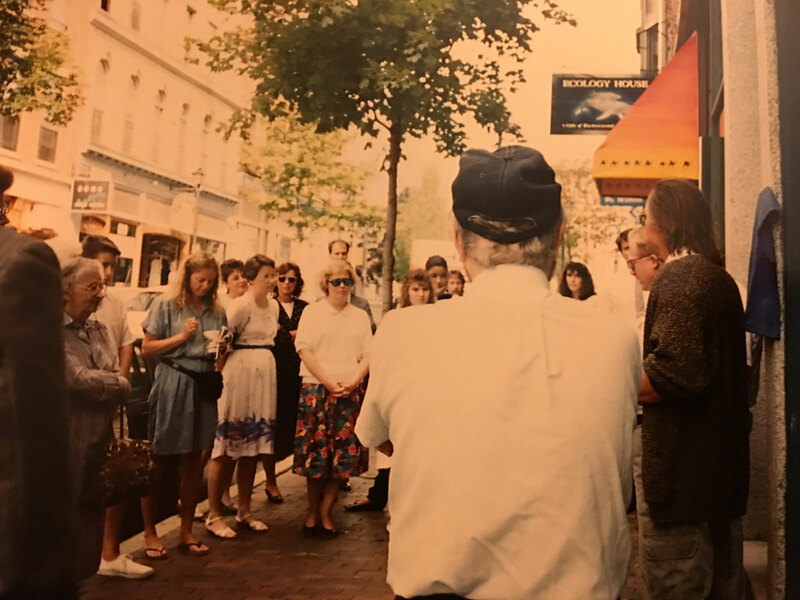 A small crowd gathers for the unveiling of the Mosher Books plaque. 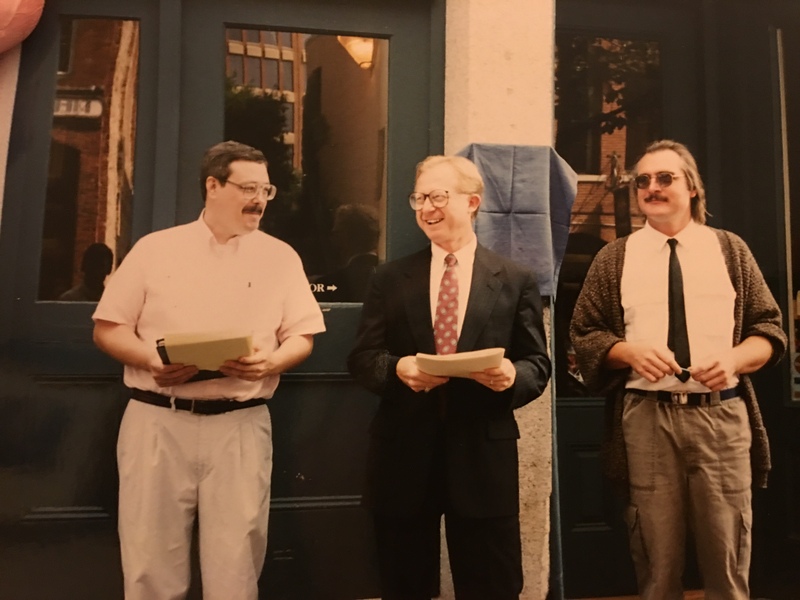 David Turner of Carlson & Turner Books presented some remarks, and the owner of the building, David Robinson of Dirigo Management Company, presented his final appreciation for the plaque and then unveiled it. Following the ceremony several of us repaired to the second floor where we toasted the publisher and the day’s event before the fireplace that once invitingly lit the office with its warm glow. It has been 67 years since Mosher’s death and Portland has not formally recognized this world famous publisher known in San Francisco and New York, in London and as far away as Bombay, India and Sydney, Australia. Barely a ripple was caused here in Portland when he died on August 31, 1923. 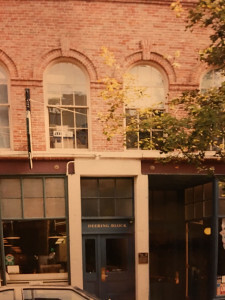 Why even while Mosher was alive and vibrant, an outside traveler on pilgrimage from some distance finally arrived in Portland only to hear a hotel clerk answer his inquiry: “Mosher? Let’s see, I believe there was a man of that name lived here but I think he died some time back.” Mosher used to chuckle over this from time to time. Well… today Portland finally offers some small token of recognition and appreciation to the man at the site of one of the two literary shrines he left behind in this city. Rather than to try to recount the many facets of Mosher’s life including his seafaring days, several life tragedies, and his Horatio Alger climb to fame, I encourage those of you here today to find out what stuff this man was made of, who attracted friends the likes of Nathan Haskell Dole of the Atlantic; Booth Tarkington; Thomas Brackett Reed nicknamed ‘Czar Reed’, the most powerful man of the U. S. Congress during the McKinley administration; authors Austin Dobson, Edmund Gosse, William Butler Yeats, Richard LeGallienne, Christopher Morley, and of course, Robert Frost who openly admitted that Thomas Bird Mosher was one of only three men who stirred a biographical impulse in him. What was it that attracted people to enter these very doors, poets like Frost and Thomas Jones, editors like St. Louis’s William Marion Reedy, and C. Lewis Hind of the London Academy, and famous actors and actresses like C. S. Williams, Julia Marlowe, Ellen Terry, Ethel Barrymore, and many others? Confessedly, my work has opened the gates of a luminous world to me. And for this very reason, I would transmit what I may, to others, even as in races of old, relays of runners passed on the burning torch. I am convinced that in literature alone is to be found and cherished the element which brings together vanished past and living present. Hence, what I have learned of storm and sun, may I not in my books make over to the men and women who reach out through intellectual sympathy and touch hands with me. Its poets and prophets are forever creating a divine unrest which must unite us all as Brethren of the Book. 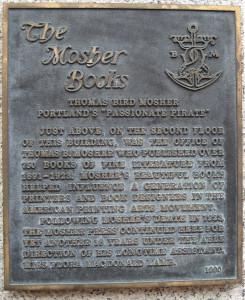 Here we stand, and up there is where he once stood, and out through these doors poured the steady stream of Mosher’s labors—these things of beauty he called “The Mosher Books.” Now, at long last, Portland begins to remember one of its most illustrious citizens—Thomas Bird Mosher. 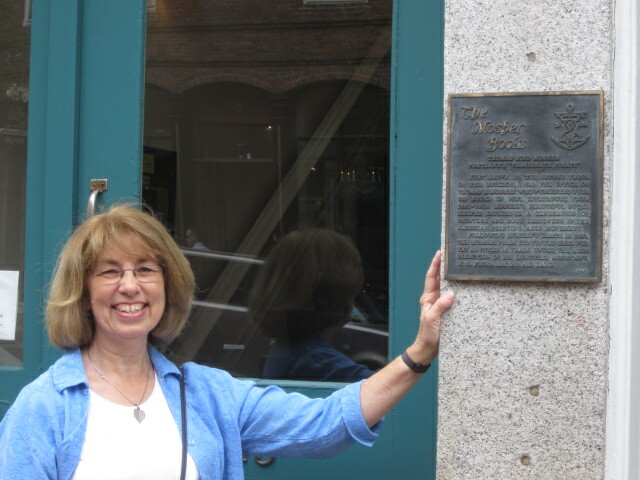 Susann Bishop, beside The Mosher Press plaque. –The above text appeared in “Thomas Bird Mosher–A Remembrance.” In The National Book Collector 2:3 (May/June 1991).